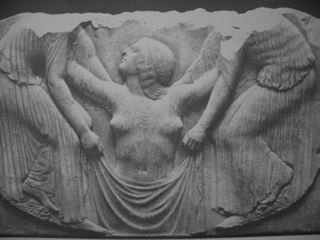 The cover Goddess image is inspired by a marble relief, “Ludovisi Throne”, which is from the Demeter Temple at Locri, Calabria, Italy, dated 480–450 B.C.E.. It is now housed in the Museo Nazionale delle Terne, Rome. No one, so far as I am aware, sees that the artist is haunted by, is as it were halting between, reminiscences of each and all. … By their articulation and separation we have immeasurably lost. ( Progleroma to the Study of the Greek Religion , NY: Meridian Books, 1957, p.312-313). Harrison sees the form of the sculpture as embodying “a tradition more theological, less mythological” – and further, “a form we may venture to call matriarchal” (ibid:314). I adopted the image as my icon in the mid 1990’s, finding that it expressed for me, Her emergence in myself – the Divine/Sacred One – as well as expressing what it is we might do for each other: and that it is always reciprocal. The image then here on the cover of PaGaian Cosmology expresses for me something much Larger – participation in Gaia’s transformation, Her never-ending renewal, particularly as it is happening and being called forth in our times.